Divorce Mediation offers a respectful, thoughtful environment where clients remain in control of the final decisions. In divorce mediation, the couple hires one neutral professional to help them negotiate a separation/divorce agreement. Generally, the couple has a series of meetings of one to two hours in length after a consultation. The mediator gives the couple homework (data collection) to be sure that all the financial information is available to both parties before any decisions are made. The meetings are essentially negotiation sessions run by the mediator. The couple makes all the final decisions, and then the mediator embodies the agreement either in a Memorandum of Understanding or a Separation Agreement. 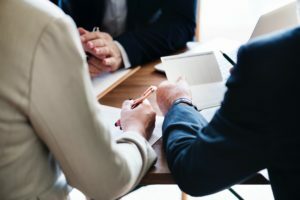 In selecting a mediator, you should interview the potential mediator and make sure both spouses are satisfied that the mediator would be appropriate for their case. Mediators differ in training, experience, style and philosophy. Mediators also differ in that some only draft an outline of the agreement and the parties have to take the outline to a lawyer to have the agreement drafted; other mediators draft the agreement, and the parties can take the agreement to be reviewed by their attorney. In our office, we draft the agreement so that the parties can just have it reviewed by their own attorney, if they wish. The mediation community has several different philosophies of mediation; both Kathryn Lazar and Brett Jones practice facilitative mediation. As facilitative mediators, we do not substitute our judgment for the client’s opinions, but instead, take responsibility for creating an environment in which productive negotiations can occur. We consider ourselves responsible for making sure that all necessary information is fully understood by both parties before any final decisions are made. We also try to make sure that both parties understand the implications of their decisions, and get whatever advice they need before they make final decisions. Ultimately, when serving as mediators, we are not acting as lawyers for either or both of the parties, and encourage both parties to secure whatever individual legal advice they might feel they need before concluding the matter. The result of mediation is a separation agreement or a divorce settlement. The individuals have an opportunity to have the agreement reviewed by an attorney before signing it. Once it is signed, it is legally binding on both parties, and is what is usually referred to by people as a legal separation. For more information about mediation, see www.mhmediation.com.